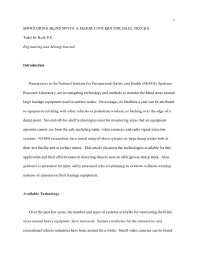 Researchers at the National Institute for Occupational Safety and Health (NIOSH), Spokane Research Laboratory, are investigating technology and methods to monitor the blind areas around large haulage equipment used in surface mines. On average, six fatalities a year can be attributed to equipment colliding with other vehicles or pedestrian workers, or backing over the edge of a dump point. Several off-the-shelf technologies exist for monitoring areas that an equipment operator cannot see from the cab, including radar, video cameras, and radio signal detection systems. NIOSH researchers have tested many of these systems on large dump trucks both at their test facility and at surface mines. This article discusses the technologies available for this application and their effectiveness in detecting objects near an off-highway dump truck. Also, guidance is presented for mine safety personnel who are planning to evaluate collision warning systems or cameras on their haulage equipment.